Miso-zuke (food preserved with miso paste) is a traditional Japanese cooking wherein ingredients are broiled after having been covered with miso paste, one of the most important components of the Japanese diet. One example of this is "miso dengaku, " which is broiled tofu with miso paste, a dish often said to constitute the origin of oden . It is also known to have a nutritional fortification effect. Enjoy the rich taste of Ohmi Beef and the flavor of miso with this recipe. 1) Place sake, water, soy sauce and mirin in a pan over heat. Once it has boiled, remove from heat and let it cool. Add white miso and stir thoroughly to soften the miso. 2) Dip beef into the mixture prepared in (1) and let it marinade for about two days. 3) Spread a cooking sheet over a frying pan. Quickly scrape off the miso from the beef prepared in (2), place on the sheet, close the lid and roast over low heat. 4) Cut the beef roasted in (3) in slices about 1/2 in. (1.5cm) thick. Steam the mukago, sprinkle some salt and skewer on pine needles. Garnish the beef with this mukago and kikka-kabu. 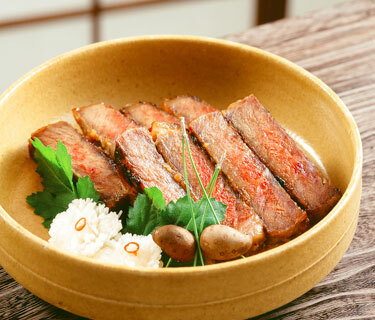 The cattle of Ohmi Beef are raised with independently selected original feed mainly containing corn and barley, as well as water from the clear streams of the Azumi River. Its characteristics include fine and delicate meat flavor and fat marbling and the creaminess with which it melts in one’s mouth. Peel turnips, make fine grid-shaped cuts and soak in water with 3% salt concentration for a while. When the turnips become tender, drain and soak in sweet vinegar (vinegar mixed with sugar and salt) together with kombu and hot pepper.